Typically there is a list of projects that I want to tackle. Since finishing the table last weekend I have cleaned up a Stanley #12 that has been sitting under my bench. Discovering that the blade angle is adjustable. Not sure how I missed that, but I’m looking forward to trying it out an some particularly gnarly wood. The plane cleaned up nicely and with a little oil on the threads the angle adjustment works easily. As I sharpened the blade I realized that it had a moderate camber. The blade is not overly long and looks well used and with the camber I wonder about what this plane has seen. Digging around on the web,there was not a lot written, so I’ll have to keep reading and do some experimentation. If anyone has some experience or resources I’d love to hear from you. Sitting next to my bench are plans for Paul Sellers Arts and Craft Lantern. Stock is selected and it is also by the bench. I recently realized that Greg Merritt prepared the plans for Paul. They are awesome! Greg stops by my blog as I’m sure he has visited yours and always adds some great comments. If you have’t seen his work take a look. Next I spent some time figuring out how to use Instagram. Eventually adding a link on the right side of my blog. If you tap on the picture it will connect to that site and you can see a couple of pictures. Over time I will use it to drop in quick snapshots. Hopefully through that link I will be able to cross paths with a new group of woodworkers and learn new skills and designs. Digging around in a coupe of boxes I pulled out this transition plane. I use it occasionally and enjoy the feeling of its wood sole gliding across a board. 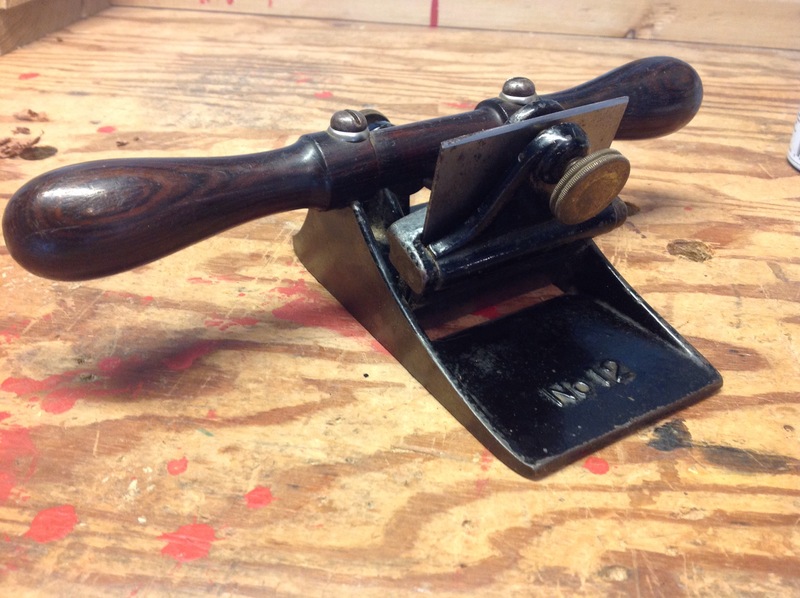 Seems that many people have a dislike for these planes although it combines the adjustability of the Stanley bench planes with the wooden sole. Beside a couple of moulding planes and a curved plane it is the only wooden bodied plane I own. Whenever I use it, I think about finding a transition smoothing plane and giving it a try. A quick coat of oil on the metal parts and some Danish oil on the wood and I tucked the plane away until I need it. 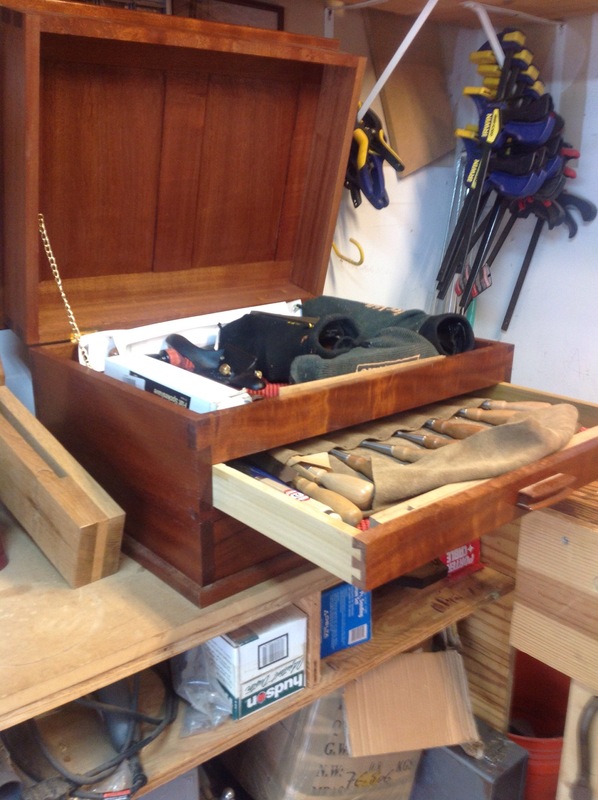 Then I sharpened all the chisels and planes that are kept in my small tool chest. These are the ones I use constantly and keep close at hand. Keeping the planes in plane socks seems to have solved most of my rust problems during the seasonal changes. Working in an unheated space like most of you is always a challenge for tool maintenance. Thats a basic summary of my week. Not a lot of woodworking but some much need time caring for tools and preparing for my next project. The big question is what will it be? For now the bench is empty. I just restored a #12 and it’s awesome scraper. It won’t replace the #80 as it takes a much finer shaving. The blade is set straight and flat with the bottom and it’s best to do that on a piece of glass or something similar. You don’t need a hook on it for it to work as it does a great job with it sharpened at a 45. Start out scraping and tilt the blade until you start seeing shavings. You have to reset the blade each time you change the angle. For a finishing cut it has no equal.